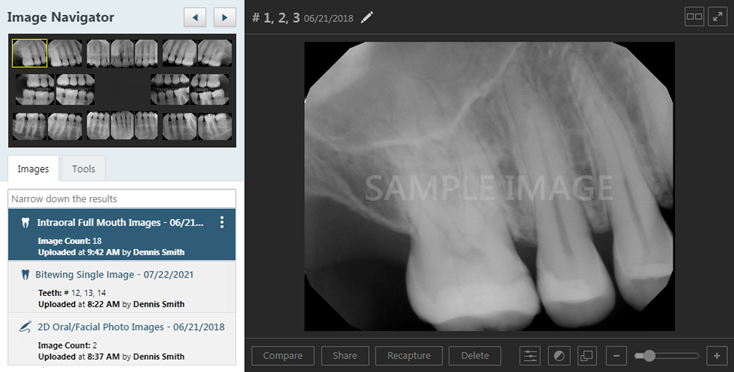 You can move a single image or a series of images from one patient's record to another's. You can move images only if they are not associated with procedures that are attached to insurance claims. Note: The procedures that are associated with the images that you are moving will be deleted or voided (if older than 120 days) in the original patient's record and posted to the new patient's record. Select an image or a series (such as a full mouth series or bitewings). 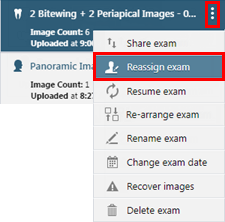 On the corresponding options menu, click (or tap) Reassign exam. 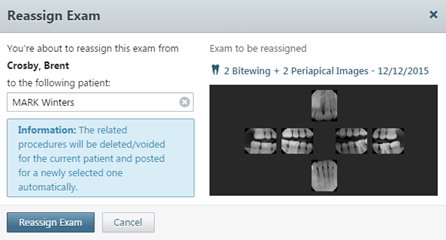 The Reassign Exam dialog box appears. Use the to the following patient search box to search for and select the name of the patient to whom you want to move the images. Click (or tap) Reassign Exam.